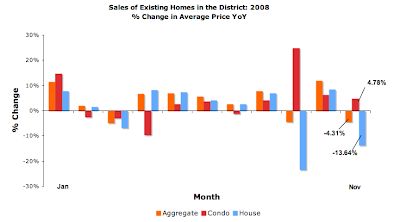 Average prices for condos rose 4.78% while those for homes fell 13.64%. 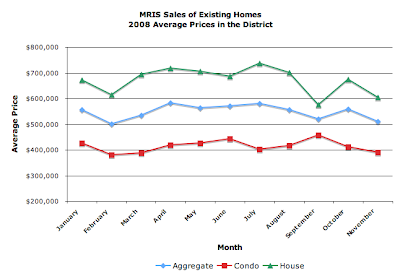 Comparing November to January 2008, the aggregate average price in the District has fallen 8.24%. The average price for a condo is down 8.61% for the year while home prices have fallen 10.09%. 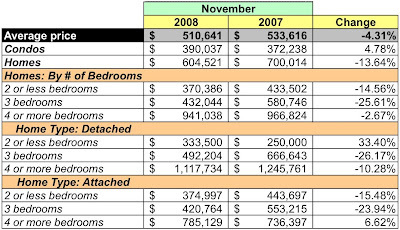 Based on November's sales volume, there are now a whopping 11.58 months of inventory for condos and 11.34 months for homes, a 32.24% increase for condos and a 31.38% decrease for homes from October. 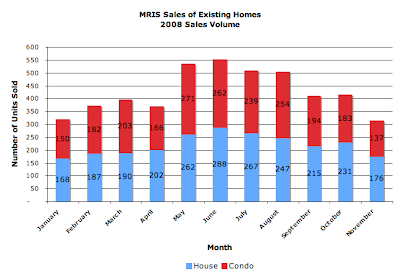 Compared to November 2007, the number of condos listed is essentially flat, up 0.19%, while home listings grew 15.72%. 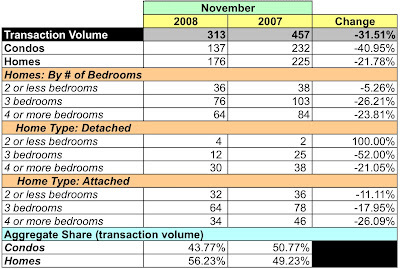 Overall, the unit sales volume in November was the lowest for the year. That was true for condos, too. November also had the lowest total dollar volume for any month in 2008. 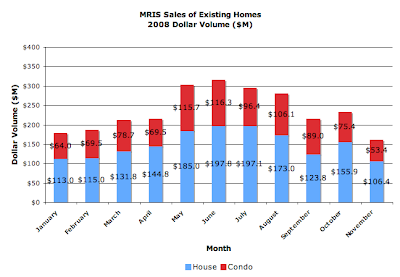 Dollar volume for condos and homes were the lowest of the year. You have the best dc data on the web. Thank you for your hard work. For average prices to have gone up this much against the backdrop of significant price declines the unit mix must have shifted radically upward, right? I can't wait to buy the data and look at the distribution! Billyhacker: I attribute it to a few very expensive properties skewing the average price value. When you look at the data table, maybe 15 properties sold for more than $1MM, but that's enough to have an impact. Lacking more granular MRIS data, it's hard to say with any accuracy what really happened.